Concerns about Islamic extremism have declined in Pakistan in recent years, but most Pakistanis continue to see it as a problem facing their nation. Moreover, many worry that extremists could take control of their country, and pluralities see al Qaeda and the Taliban as serious threats. The violence associated with Islamic extremism is the primary concern of Pakistanis who worry about extremism, and this has become increasingly so in the wake of Osama bin Laden’s death. But many also fear that extremism will hurt the economy and, to a lesser extent, that it will lead to divisions in their country and to loss of personal freedoms and choices. Al Qaeda, the Taliban and its affiliated groups, and Lashkar-e-Taiba, a Pakistani extremist organization that is active in Kashmir, receive low ratings in Pakistan, and Pakistanis overwhelmingly reject the violent attacks against civilians that are associated with these groups. When asked about the possibility of the Taliban regaining control of neighboring Afghanistan, however, slightly more Pakistanis say this would be good for Pakistan than say it would be bad; many Pakistanis say it would not matter for their country or do not offer an opinion. Still, most see the situation in Afghanistan as a very big problem for Pakistan, and nearly seven-in-ten want U.S. and NATO troops to leave Afghanistan as soon as possible. About six-in-ten (63%) Pakistanis say they are very or somewhat concerned about Islamic extremism in their country these days, and 55% express similar concern that extremists could take control of Pakistan. Concerns about extremism after the U.S. military raid that killed Osama bin Laden are consistent with concerns just prior to bin Laden’s death and a year before, but have declined considerably since 2009. Two years ago, nearly eight-in-ten (79%) said they were concerned about Islamic extremism and 69% were very or somewhat worried about an extremist takeover. By 2010, 65% expressed concern about extremism in their country and about half (51%) feared that extremists could take over Pakistan, levels that remained essentially unchanged in the month preceding bin Laden’s death, when 63% expressed concern about Islamic extremism and 52% worried that extremists could take control of their country. Following bin Laden’s death, somewhat more Pakistanis rate his organization as a serious threat than did so just before he died (49% vs. 44%). The percentage of Pakistanis rating al Qaeda as a threat to their country has increased since last year, after dropping considerably between 2009 and 2010; 38% saw the organization as a serious threat in 2010, compared with 61% in 2009. Perceptions of the Taliban as a threat to Pakistan are unchanged from last year with 54% seeing the Taliban as a serious threat. 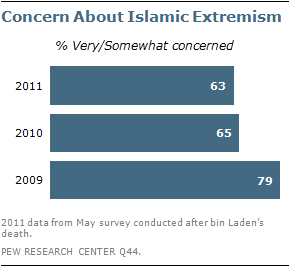 As is the case with views of al Qaeda, however, far fewer now see the Taliban as a threat than did so in 2009, when 73% expressed concern. Fears of Islamic extremism are especially pronounced in Punjab, where 70% say they are concerned about extremism and 60% worry that extremists could take control of Pakistan. By comparison, 58% in Sindh, 53% in Khyber Pakhtunkhwa and 26% in Baluchistan are concerned about Islamic extremism and 52%, 51% and 25%, respectively, worry about an extremist takeover of Pakistan; more than six-in-ten in Baluchistan do not offer opinions on these questions. More than half in Punjab (56%) and Sindh (61%) consider the Taliban a serious threat to their country, compared with 47% in Khyber Pakhtunkhwa and 17% in Baluchistan. Concerns about al Qaeda are most common in Sindh, where nearly six-in-ten (58%) consider the group a serious threat; 50% in Punjab, 42% in Khyber Pakhtunkhwa and 11% in Baluchistan share this concern. About three-quarters (78%) in Baluchistan do not offer an opinion about the threat posed by the Taliban and 84% do not offer opinions on al Qaeda. 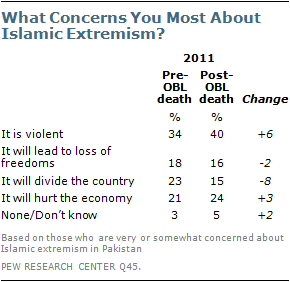 When those who say they are concerned about Islamic extremism in Pakistan are asked what concerns them most about extremism, four-in-ten say it is the fact that it is violent; 24% are primarily worried that Islamic extremism will hurt the economy, while about one-in-six say their main concern is that it will lead to people having fewer personal freedoms and choices (16%) or that it will divide the country (15%). Few in Pakistan express positive opinions of militant groups like al Qaeda, the Taliban and Lashkar-e-Taiba. Currently, just about one-in-eight (12%) rate al Qaeda favorably and 55% have an unfavorable view of the group; a year ago, 18% expressed positive views and 53% had negatives opinions of al Qaeda. Al Qaeda’s late leader, Osama bin Laden, received mostly negative ratings from Pakistanis in the weeks before his death; just 21% said they had confidence in bin Laden while 42% lacked confidence in him. Views of the Taliban and its affiliated groups also remain negative. About one-in-eight (12%) Pakistanis have a favorable opinion of the Taliban, while 63% give the group a negative rating. Tehrik-i-Taliban, an umbrella organization of Taliban-linked groups in Pakistan, and the Afghan Taliban are viewed favorably by 19% and 15%, respectively; about half have an unfavorable opinion of Tehrik-i-Taliban (51%) and the Afghan Taliban (50%). Many do not offer an opinion of these groups. Similarly, views of Lashkar-e-Taiba are, on balance, negative; 27% have a positive view and 37% have an unfavorable opinion of the group. More than one-third (36%) of Pakistanis do not offer an opinion. For the most part, opinions about militant organizations do not vary significantly across demographic groups or regions. However, in Punjab, where Lashkar-e-Taiba is based, opinions of that group are more positive than in other provinces; about a third (34%) in Punjab rate Lashkar-e-Taiba favorably and nearly the same number (35%) offer negative views. In the other three provinces, opinions of Lashkar-e-Taiba are, on balance, negative. More Pakistanis now say that the situation in Afghanistan is a very big problem for their country than did so a year ago; 60% say this is the case, compared with 51% in 2010. About seven-in-ten (69%) say the U.S. and NATO should remove their troops from Afghanistan as soon as possible, up slightly from 2010, when 65% wanted troops to withdraw from the neighboring country. Just 8% think troops should remain in Afghanistan until the situation is stabilized and 22% do not offer an opinion. When asked whether it would be good or bad for Pakistan if the Taliban were to regain control of Afghanistan, somewhat more now say it would be good (26%) than say it would be bad (21%); a year ago, 18% believed it would be good for Pakistan if the Taliban regained control of Afghanistan and 25% said it would be bad. Still, as was the case in 2010, many Pakistanis say it would not matter if this were to happen (26%) or do not offer an opinion (27%). Pakistanis continue to reject the notion that suicide attacks against civilians in defense of Islam can be justified. More than eight-in-ten (85%) Muslims in Pakistan say this kind of violence is never justified; another 3% says it is rarely justified and just 5% say it is sometimes or often justified. Rejection of suicide bombing against civilians is more widespread among Pakistani Muslims than among any other Muslim public surveyed, although majorities in Indonesia (77%), Turkey (60%) and Jordan (55%) also say these types of attacks are never justified. About four-in-ten Muslims in Israel (41%), Lebanon (39%) and Egypt (38%), and just 19% in the Palestinian territories, reject suicide terrorism. Views of suicide bombing in Pakistan are far more negative than they were earlier in the decade. In 2002, when the Pew Research Center first asked this question, one-third of Muslims in Pakistan said violent acts against civilians in defense of Islam were often (19%) or sometimes (14%) justified; about four-in-ten (38%) said they were never justified.